I’m so excited!!! I found out about KCWC last year just in time to participate. 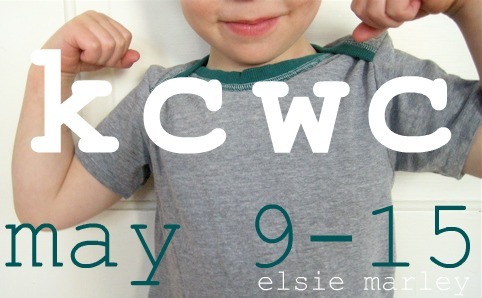 KCWC is hosted by Meg from ElsieMarley. 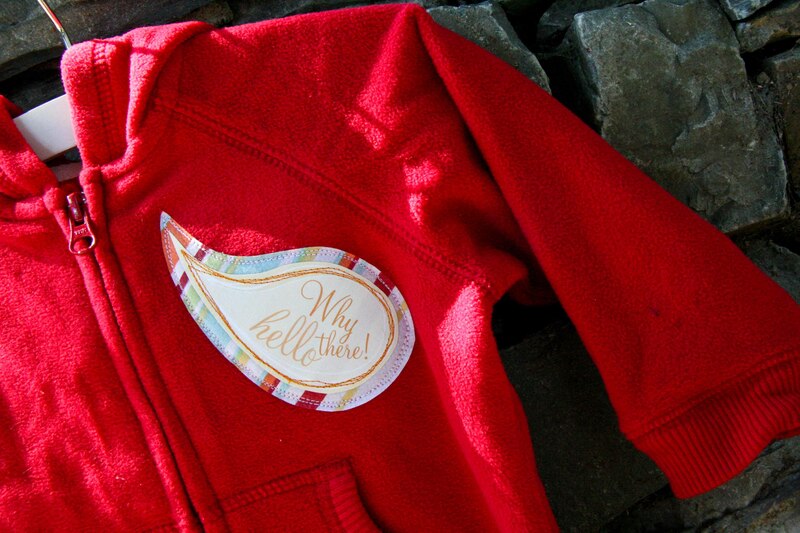 She has some amazing kids clothes and projects that she shares in her blog. If you haven’t sen it, you should check it out. It’s one week (I’m sure you figured that out) where we commit to sew one hour a day for 7 days. Sewing clothes, of course, for our kids! Or other people’s kids, but not your inner child and absolutely not your canine child. I wanted to share a few of my favorite projects from last year. 1. This hat by Clementine’s Shoes is just beautiful. I need to make my son a sun hat for our upcoming beach trip!!! 2. These pants by ElsieMarley caught my eye! I love the star pocket, but I also love how comfy they look. 3. Man, I remember when I first saw this little shirt by U.K. lass in U.S., I was floored. Amazing details. Beautiful! 4. Aren’t these hats by Moth and Sparrow just the cutest little things??? 5. I love this coat by Lindsay a. p.. It’s very cute, but the coolest thing about it is she made it for her son and daughter to both use. 6. The fabric of this dress by Fede Design Textiles is what first caught my eye, but upon closer inspection, the whole thing is just totally cute. Are you participating in KCWC this year? What’s on your list??? I keep saying, no more projects until after my exam…. I’ve mentioned Katie Moon’s blog, oohmoon, before. She’s an amazing illustrator and has inspired a few of my projects. My advent calendar was the first one. Here’s my second. And the third will be coming up later (ahh, don’t you just love the suspense??)…. Each day, Katie posts an illustration that’s free for one day. This past week or so she has been posting portions of illustrations she’s using in a book she has made. These two illustrations are from her book that when I saw them, I immediately knew exactly what I was going to make with them! I’ve been trying to make all of our friends birthday presents and holiday presents lately. But of course, I said no more making things… So our little friend Owen’s birthday was creeping up. We got him a pretty cool little truck toy, but that whole handmade thing kept whispering in my ear. Then I saw these illustrations! I have a stash of little hoodies that I bought when I was on an applique kick. The applique kick passed fast and I am now left with a stash. They’ve come in handy though! Owen is one of the smiliest little guys I know. He’s only 1, so he’s not saying too many words yet. But I totally see him flashing that big smile and saying, ‘Why Hello there!! !’ So I had to applique this to a little sweatshirt for him. It was just too fitting for our little cheery friend! 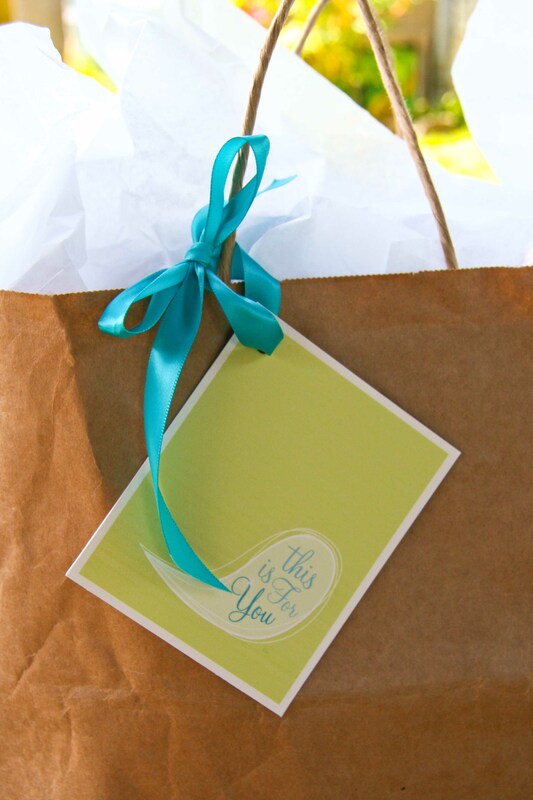 And who doesn’t love a coordinating gift tag??? I’m super excited about the Kid’s Clothes Week Challenge coming up next month. So excited that I was going to do a link love of some of my favorites from the last challenge. That was until I realized that today is Earth Day! 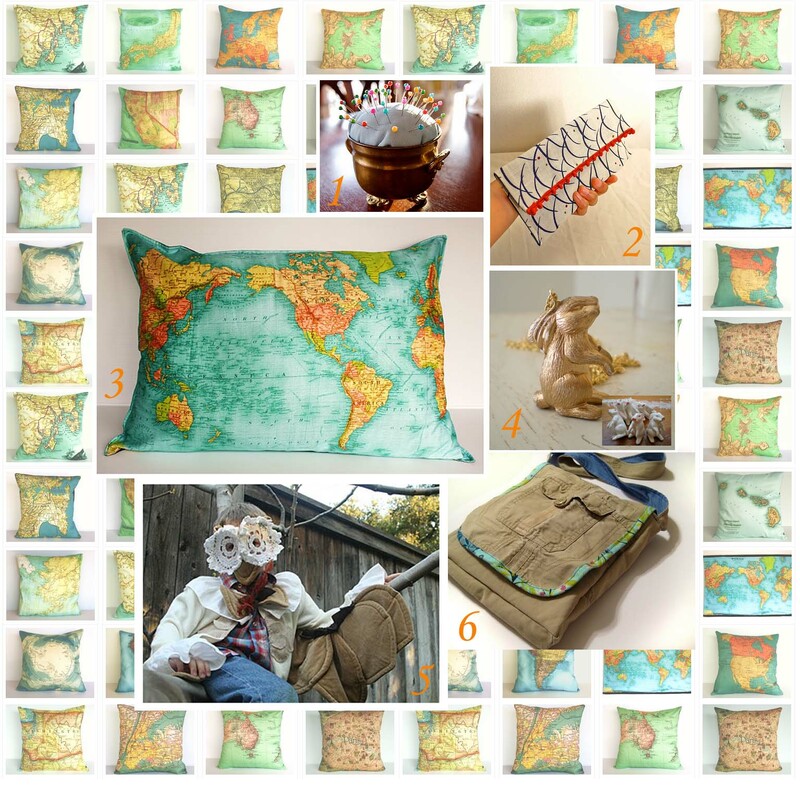 And as you know, I’m all about the whole recycling and upcycling thing, so here are a few of my favorite recent upcycled finds in honor of Earth Day. 1. Some close friends brought me a beautiful pin cushion back from China. Unfortunately, I dropped it on my concrete floor. I glued it back together and it worked for a while. Until… I dropped it again. This only shows how much I loved it and used it. Ok,and yes, and that I must be a bit clumsy. Just a little bit though… Anyway, I found this pincushion project from The Fainting Goat made from an upcyced little brass pot. I think I’m going to have to try it! 2. This is a lovely little clutch, or makeup bag, or anything bag by A Very Purple Person. The secret is that this bag is made from an upcycled place mat! 3. OK, so this isn’t made from upcycled anything. But it’s the WHOLE WIDE WORLD! This pillow and all the ones in the background are printed on organic cotton and sewn by hand by My Bearded Pigeon. Yep, more maps! I LOVE MAPS!!! And I absolutely love these pillows. Fantastic! 4. And in the spirit of Easter, I love this upcycled bunny necklace by Andrea Rodgers. 5. Check out this great owl costume and mask by April and Her Bright Ideas! Check out her blog for the upcycled tutorial. 6. I never realized how perfect all the pockets in cargo pants would be for making a messenger bag! Check out Noodleheads tutorial to make your own. Readers keep telling me that they are going to make this or that project, so I’ve been wanting to start a flickr group. Well, today a reader told me that she had already made something!! That was the motivation I needed to finally set up a flickr group for my blog’s projects!! Thanks, Allison! 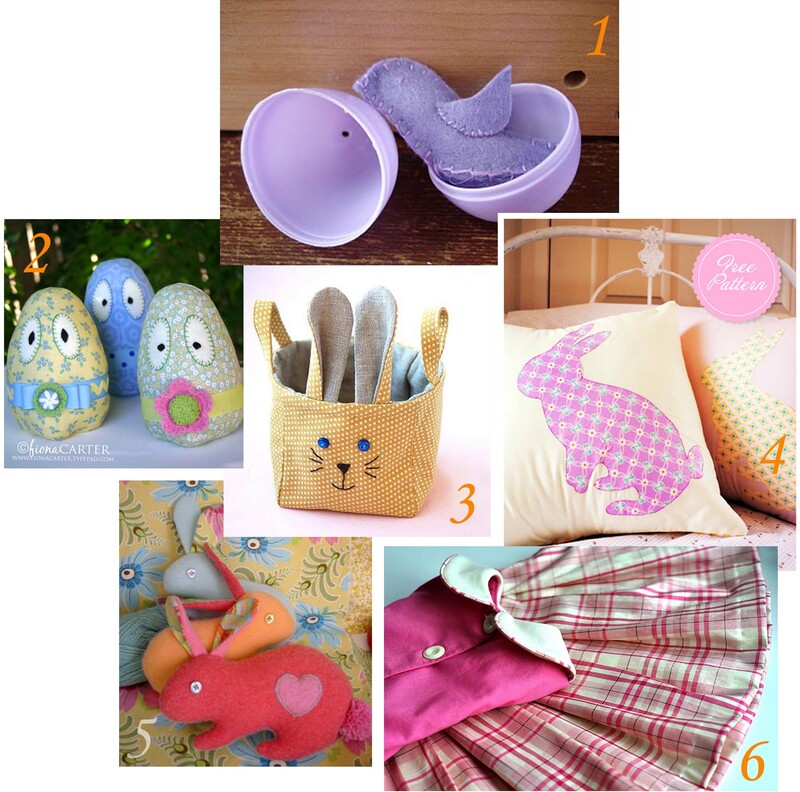 So, please, if you’ve been inspired to make anything you’ve seen on my blog, please post your pictures in the new I’m Feeling Crafty Flickr group! 1. 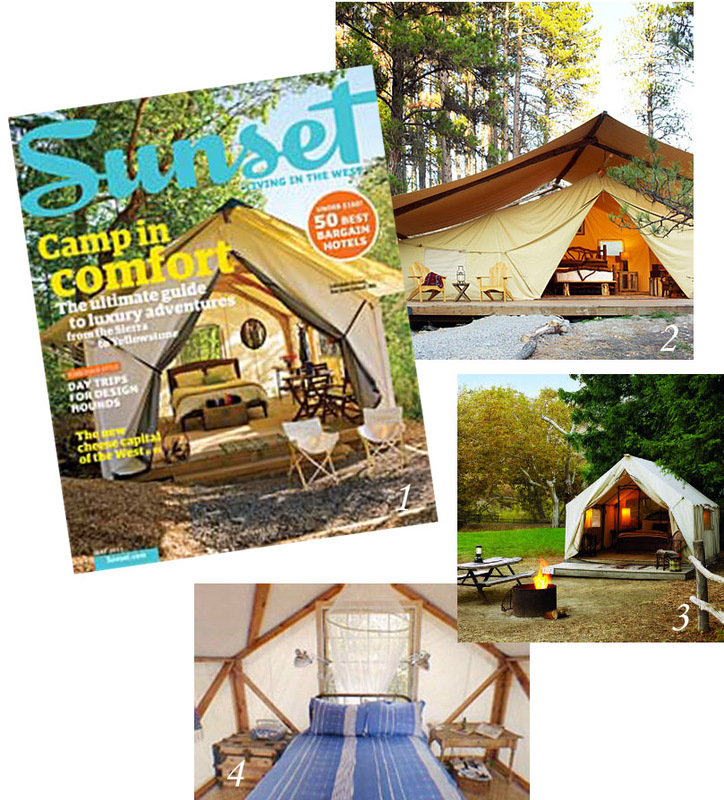 The color scheme is from the Sound of Music, via Bella Figura. 2 & 3. Loving the mossy tables with the wood grain vases and pedestals. Image 2, Southern Living via Celebrations at Home. Image 3, a Gloria Wong Design via Celebrations at Home. More to come on this one!! 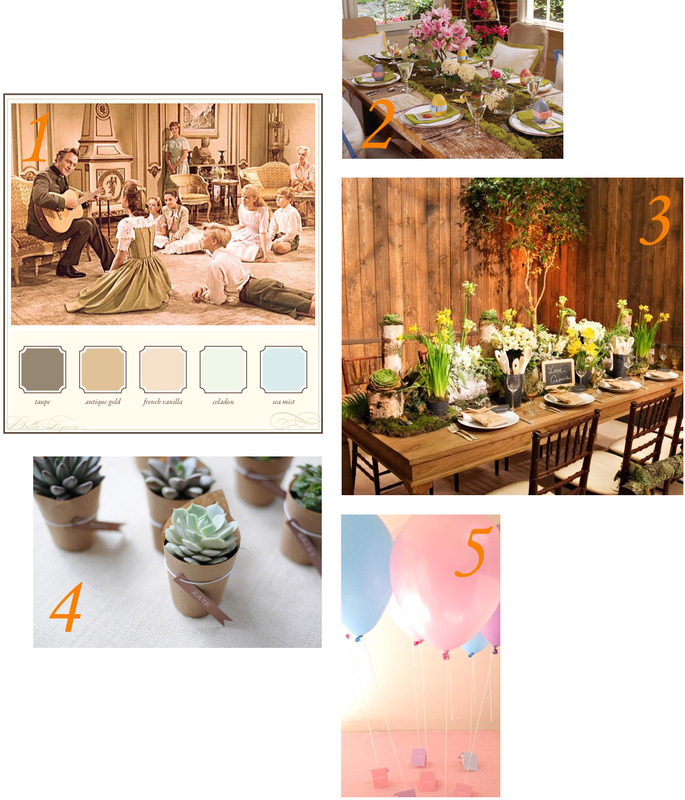 Do you have any woodsy ideas for a spring reception??? Let me know! Wow, today I had the most views ever on my blog. I got excited when I saw the stats pass 200 and then move to 400 views. But I ended up with over 1,700 for the day. 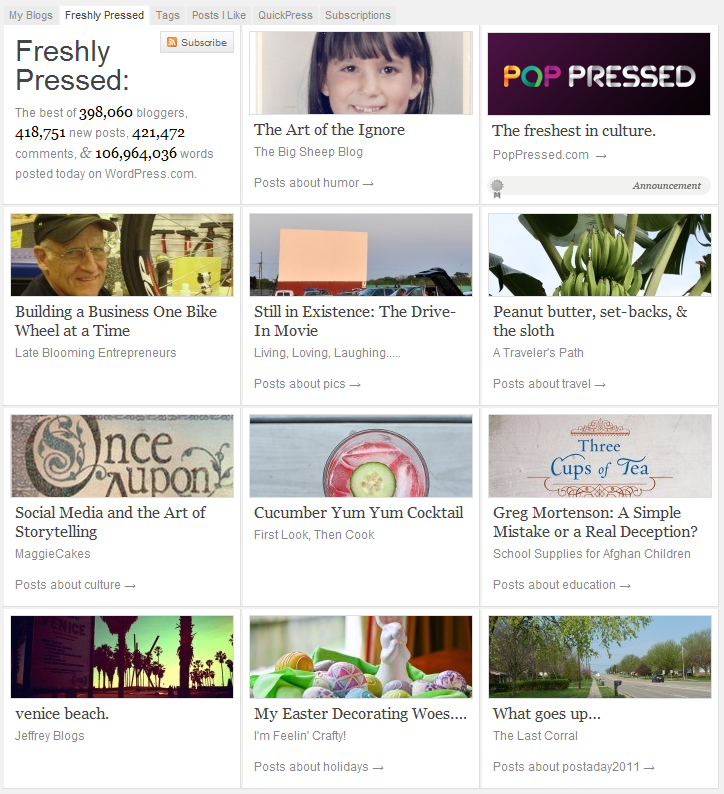 That might not be much for a lot of blogs, but…. That’s a Feelin’ Crafty record! Thanks to everyone for all the awesome and fun comments. It was so exciting to read all the comments and see all the ‘Likes’ come in. I have to admit it was hard to concentrate at work today. Comments and ‘Likes’ from all over the world, from here on the west coast of the USA to the east coast and all between, to Pakistan, China, England, Australia and more! What a Happy Day! Thanks again everyone! Now, I’m sure really why the easter bunny delivers eggs. And where did the whole easter bunny thing come from anyway?? Anyway…. I feel like just throwing my hands up with my decorating for this holiday… Everything turned out halfway. In the world of the cup half full, that’s great. In the world of the cup half empty, it got frustrating. With these projects I seem to be teetering right there in the middle of the cup! 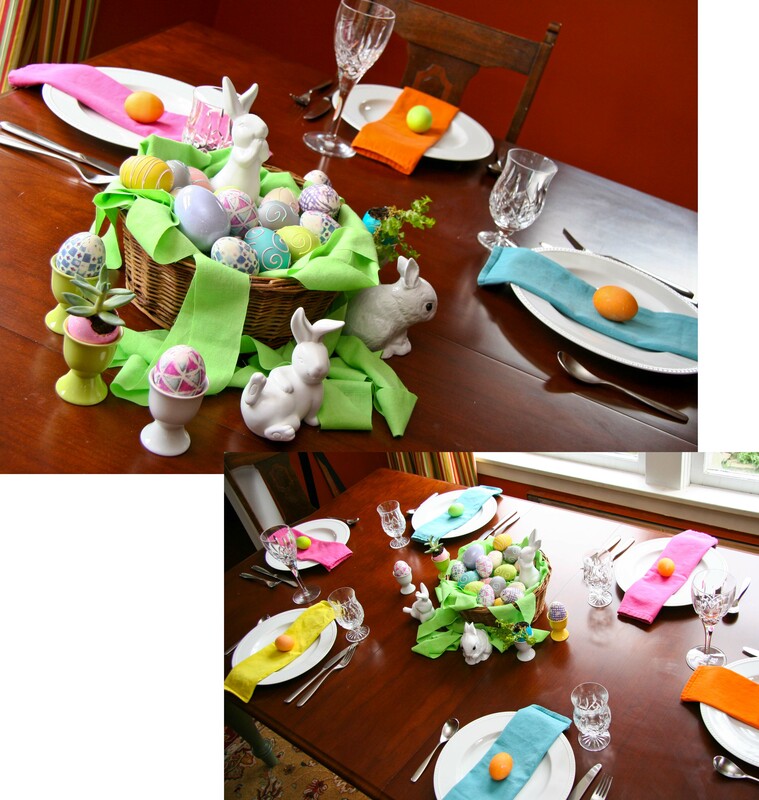 I’ve never really decorated much for Easter, or really many holidays other than Christmas. But having a kid around makes decorating for holidays so much fun. 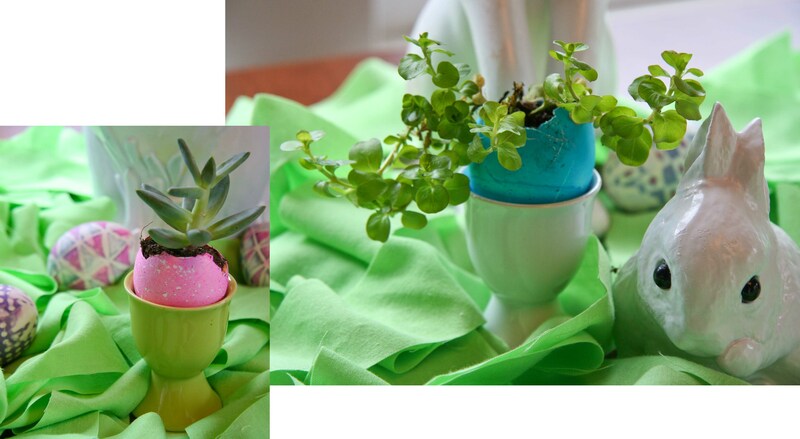 Project 1- I’m sure everyone’s seen these eggshell flowerpots from Martha Stewart. 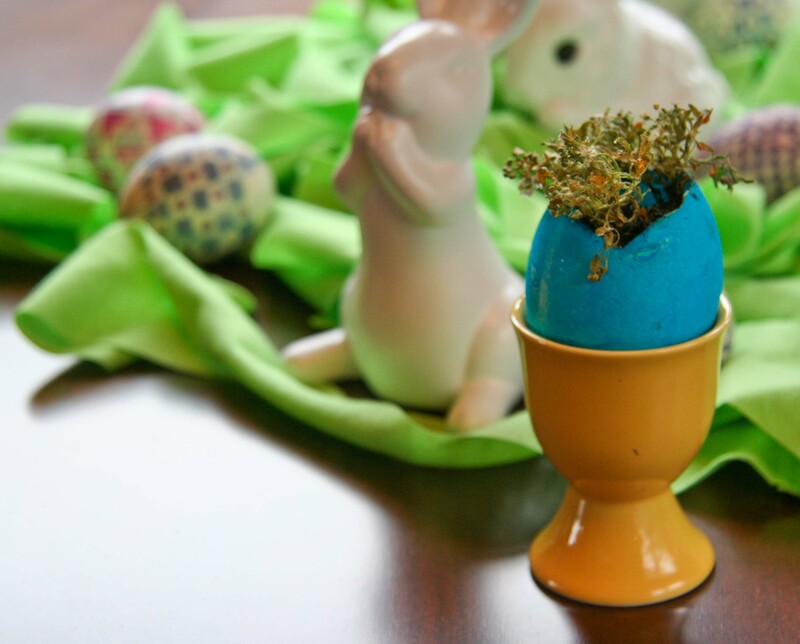 The Half Full Part- We put our spin on it with dying the egg shells before we planted some cute little flowers. My son was loving dying the eggs and then planting the flowers. 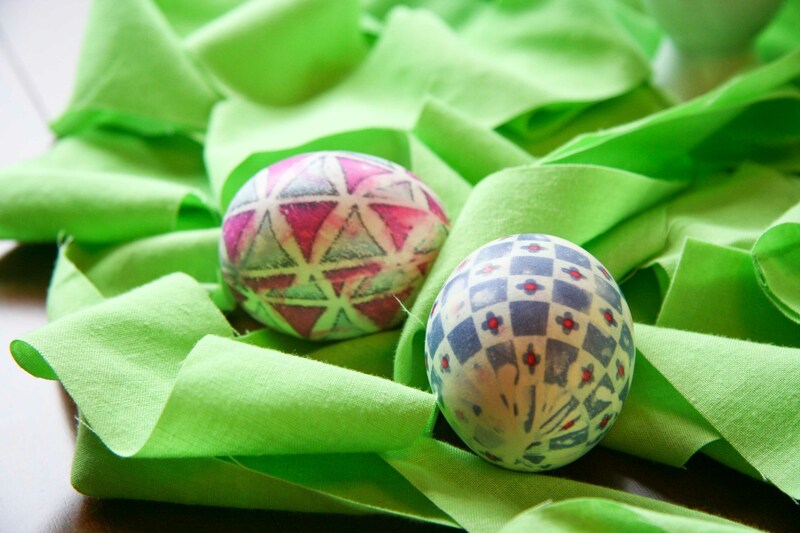 Project 3- Another Martha idea… Silk dyed easter Eggs. The Half Full Part- I got a few silk ties from Goodwill and off we started on another project. It was fun, but…. 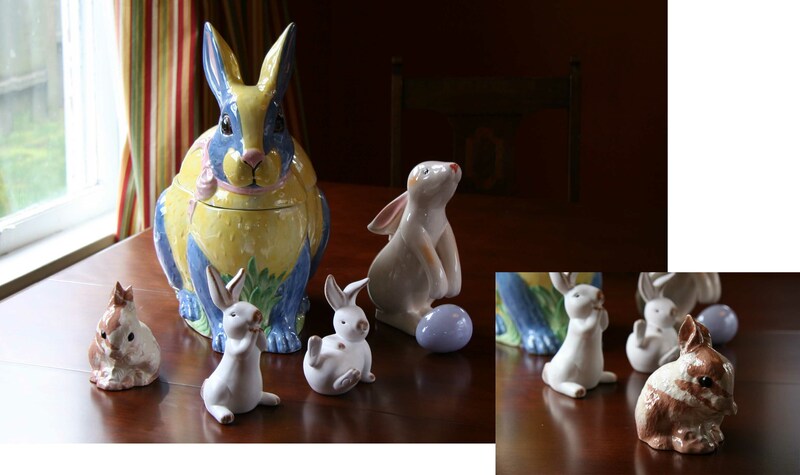 Most of them turned out, but not quite as perfect as they would for Martha…. We were excited though. My son loved unwrapping them after they boiled! The Half Empty Part- Of course my son picked his favorite to be the red tie. Which although it said silk, must not have been since those eggs didn’t get dyed. And of course, those were the ones we unwrapped first. Luckily the other ones worked and it wasn’t a complete disappointment! Project 3- If you’ve read other posts, you probably already know I am a spray paint lovin’ kind of gal! And if you’ve read any of my other posts, you already know that I also love to upcycle and recycle anything I can. Yes, I love to buy new, too, but I really try to find things used first and make them exactly what I want. 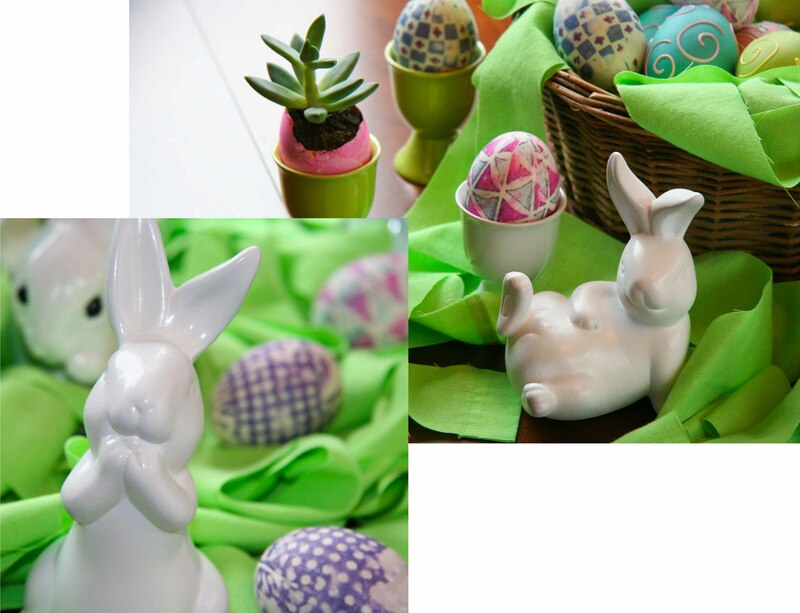 That was a long introduction for my third Easter project I have to tell you about. 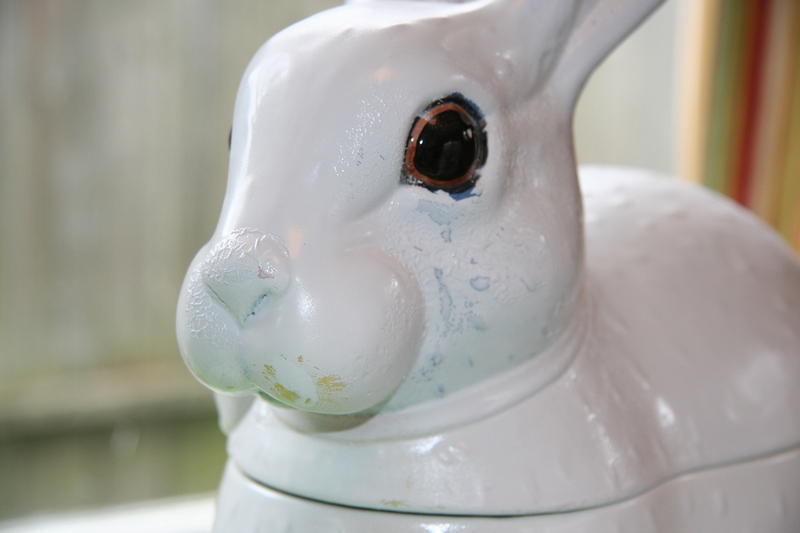 Spray painted bunnies…. Starting with the Half Empty Part- And after…. From a distance they look nice, right. Well, let’s take a closer look! Lesson Learned- When the spray paint says to sand glossy surfaces, they mean, sand glossy surfaces…. The Half Full Part- The ones that weren’t glossy turned out pretty cute! 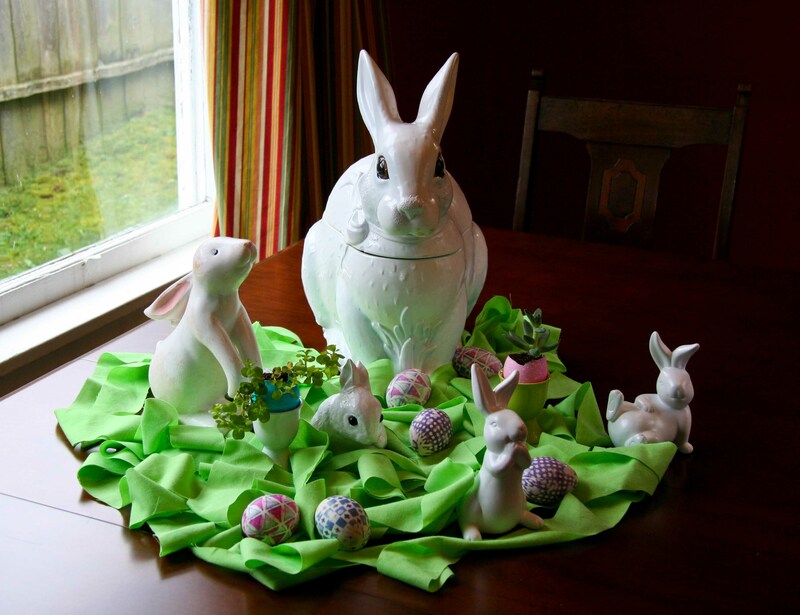 All in all our table decoration turned out quite nice and probably a better size than I had originally planned…. I think it’s perfect despite our ups and downs of decorating. So I’ve shared my blunders and my successes. 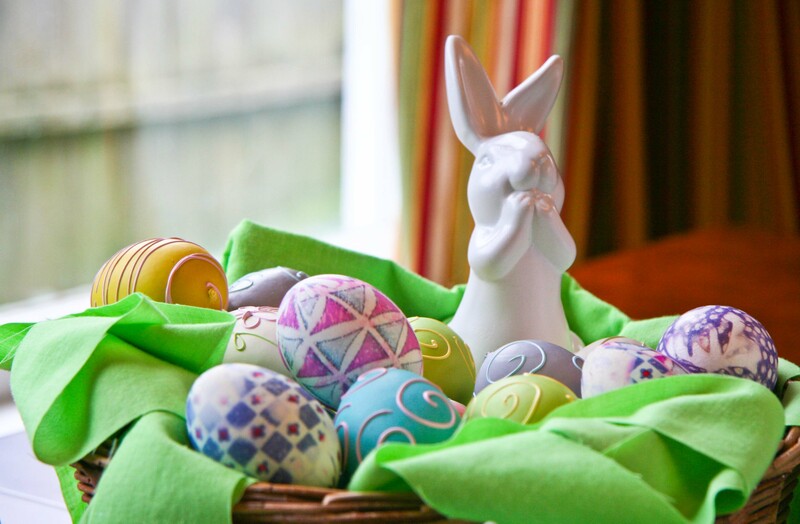 Have you had any funny decorating mishaps that have turned out to just the right design? I’d love to hear! Well, here we are at the third and final installment of my posting about one of my obsessions, Map Quilts! Thank you everyone that has stopped by my blog and left such wonderful comments about Valerie’s work. It’s been so much fun hearing from everyone. And sooo inspiring! I thought I’d get Valerie to tell us a few things about the 2 quilts that have the most comments. The two top favorites are Labyrinth of the Hidden Goddess and City Grid V.
I love abstract art, architecture and maps. Both quilts are my way of working all those interests into my art. An essay by Mimi Lobell called “The Buried Treasure — Women’s Ancient Architectural Heritage” describes “female centered” architecture of pre-historic times. Her article served as the genesis for a series of quilts inspired by Paleolithic and Neolithic settlements whose art and architecture was infused with female imagery. I was inspired by a drawing I discovered of a neolithic settlement. The information about the settlement described a women centered society where the female goddess was supposedly a central figure of worship. If you look closely a the center of the quilt is a female statuary, hidden at the center of the labyrinth-like map. This quilt will be on the cover of the upcoming Spring Issue of “Studio Art Quilts Associates”. This one In my opinion, is more abstract than many of my other quilts. The city “lines” or streets as well as the “shapes” or buildings are very organic. They grow out of the bottom of this piece where I created an abstract skyline of a city. It was used as the cover art for a book published by Yale University Press. The book was called “Ordering the City” . I’m so excited that Valerie is going to be heading my way in September. She’ll be teaching three workshops at the La Conner Quilt Festival, Creativity in B&W, Favorite Places and Map Haiku. I sure do hope I can be there. But what class to choose???? Check out her event page to see when she’ll be near you! 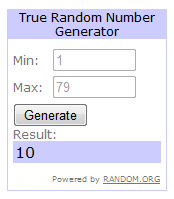 and the suspense grows… Who won the mini art quilt??? I have loved Valerie’s work for some time. My favorite (today) is Labyrinth of the Hidden Goddess. I am trying to do everything I can to get to one of her classes this summer. All the rest is done.